Striker James Collins bagged his second hat-trick of the season as Luton handed Mick Harford a first win as interim boss, hammering promotion rivals Peterborough United this afternoon. The Posh, reduced to 10 men midway through the first half, were simply no match for the Hatters after that, Town playing some scintillating football to cut through their opponents at will, earning a first win over a top six side this season. Harford made one change to the side from Tuesday night's FA Cup exit to Sheffield Wednesday, Alan McCormack in for Elliot Lee, who had a hamstring injury, meaning Luke Berry pushed up to the tip of the diamond. Town took the lead on just eight minutes with a lovely move that saw Andrew Shinnie start from deep, easing away from his markers and then play the perfect ball wide for Jack Stacey, who picked out Collins to bundle over the line from two yards. Matty Pearson picked up his first booking of the campaign, as Posh responded well to going behind, Jack Stacey giving possession away and Lee Tomlin flashing narrowly wide from 20 yards. Marcus Maddison tested James Shea from distance, while he also put a free kick over the top, but the crucial part of the half came on 25 minutes. Posh defender Ryan Tafazolli slid in to catch Shinnie, and after a long chat with his linesman, referee David Coote reached for his top pocket to produce red. Luton took full advantage as well, with the same triumvirate integral in making it 2-0 just two minutes later. Once again, Shinnie picked out the run of Stacey on the right, once again, he crossed low into the area, and once again, Collins was there, with an even better finish this time to rifle home. Berry almost had a cracking third on the half hour, arrowing an effort from 25 yards on his left foot that the giant Aaron Chapman just managed to extend his arms to and fingertip behind. Collins should have completed his treble in the 35th minute, with this time, the danger coming from the left, as when James Justin's cross was half cleared, he missed the target, volleying wide. With Town well on top and dominating every aspect of the game against a visiting side whose heads had clearly already gone, they again quickly came close to a third. McCormack produced some outrageous skill to get away from his marker and with Luton lining up to shoot, but not pulling the trigger, the midfielder took matters into his own hands, off target. There was no let-up by the Hatters in the second period either, as they had extra breathing space just eight minutes in, LuaLua intercepting a pass on the right and drove at the away defence. Looking up, he spotted the run of Collins, who let it run across the body and on the run, fired first time on his left foot beyond Chapman for his second hat-trick of the season, and third in Luton colours. Collins should really have had a fourth as Posh coughed up possession cheaply yet again and he was sent clear, but trying to pick out the top corner, slamming over. It mattered not though as Town struck four on 66 minutes when LuaLua threaded a pass through to Berry who spun his man superbly before faced with Chapman, easily beat him for a first goal since February. With the points in the bag, Town gave debuts to new signings George Moncur and George Thorne, as they proceeded to toy with their opponents at times. LuaLua went for his first league goal, easy for Chapman, before a glorious move involving the attacker and Moncur saw Town's new boy beat one, then a second, before his low shot was too good for Chapman, but not defender Ben White who got back just in time. The shell-shocked visitors were reduced to efforts borne out of pure desperation in the end, Maddison's 45 yard bouncing into Shea's gloves, with his next attempt, thundering over. Luton still sensed blood, LuaLua slicing wide after overlapping on the left, while Moncur's effort didn't come down in time, as they ran out handsome winners. 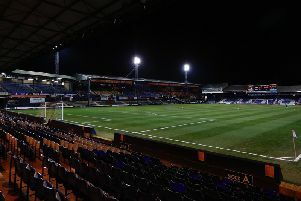 The result was made to look even better with leaders Portsmouth losing at Oxford United, as Town cut the gap to a single point, while third-placed Sunderland were held at Scunthorpe United, meaning Luton moved three points clear of the Black Cats. Hatters: James Shea, Jack Stacey, James Justin, Matty Pearson (Alan Sheehan 77), Sonny Bradley (C), Alan McCormack (George Thorne 69), Pelly-Ruddock Mpanzu, Andrew Shinnie (George Moncur 69), Luke Berry, James Collins, Kazenga LuaLua. Subs not used: Harry Isted, Lloyd Jones, Alan Sheehan, Aaron Jarvis. Posh: Aaron Chapman, Jason Naismith ©, Ryan Tafazolli, Ben White, Siriki Dembele (Joe Ward 29), Callum Cooke, Ivan Toney, Danny Lafferty, Marcus Maddison, Lee Tomlin (George Cooper 46), Kyle Dempsey (Alex Woodyard 46). Subs not used: Matt Godden, Louis Reed, Conor O'Malley, Mathew Stevens. Booked: Pearson 12, Maddison 63, Toney 73.